Cory Weir talks to The Taylor Report, CIUT-FM, about Unifor’s disaffiliation from the Canadian Labour Congress, which has divided and weakened the workers’ movement in Canada. On January 17th, 2018 Jerry Dias, National President of Unifor, announced that he was disaffiliating our union from the 3.5 million member Canadian Labour Congress “effective immediately”. This division of Canada’s labour movement will be a huge blow to the struggles of workers across the country. The decision was ratified by Jerry’s hand-picked Unifor National Executive Board, who have never been known to stand up to him on any issue. But why weren’t we consulted as Unifor members? Why didn’t Unifor members get to vote? Supposedly this destructive move was taken in the name of “union democracy” – what a joke! The dues-paying members of Unifor never even knew disaffiliation was being discussed or voted on. What has motivated this undemocratic action? As many people have pointed out, part of the reason is Jerry’s desire to continue raiding other unions, instead of organizing unorganized workers. His efforts to engineer a takeover of the TTC workers of ATU Local 113 blew up in his face, even though Hassan Yussuff, CLC President, bent over backwards to try to help him. Yussuff unilaterally suspended part of the CLC Constitution to allow the raid, but was eventually forced by other CLC affiliates to reverse his position. (It has been pointed out by some, that Jerry Dias spent some $1 million of Unifor’s funds to get Hassan Yussuff elected as CLC President.) Jerry struck a deal with Bob Kinnear, ATU Local 113 President, to bring his members into Unifor, which one of Kinnear’s supporters referred to as “the big white shark”. At that time, Jerry also promised there would be support from Justin Trudeau and Kathleen Wynne. But none of that translated into support from TTC workers, so the attempted raid fizzled out. Now the “big white shark” has another victim in its sights – the 8,000 Toronto hotel workers who are members of UNITE HERE Local 75. Knowing that he is unlikely to get the CLC to acquiesce to more raiding, Dias has decided to pre-emptively leave the CLC so that he can raid with impunity. The day after the disaffiliation Unifor was already trying to get hotel workers to sign Unifor cards. 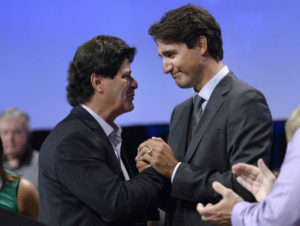 Prime Minister Justin Trudeau clsps hands with Unifor President Jerry Dias, left, after speaking to the Unifor Convention on Wednesday, Aug. 24, 2016 in Ottawa. Hargrove, President of the CAW, have been instrumental over the last few years in helping the Liberal Party capture a large chunk of the Canadian labour movement. They call their policy “strategic voting” but it is clearly designed to benefit the Liberals. In recent elections unions have contributed more money to the Liberal Party than to their traditional political partner, the NDP. In the 2011 Ontario provincial election, unions contributed a total of $1,019,876 to the Liberal Party, and a strategic voting front group, the Working Families Coalition, also primarily funded by unions, spent an additional $2.1 million on advertising against the Conservatives. Union contributions to the NDP were $836,956. Part of cementing this Liberal ideological takeover of the labour movement has been installing Hassan Yussuff, a Unifor staffer, whose partner is an assistant to Jerry Dias, as President of the CLC; and displacing Sid Ryan with Chris Buckley, another Unifor staffer, as President of the Ontario Federation of Labour. OFL President, Chris Buckley, Toronto and York Region Labour Council President, John Cartwright, Unifor President, Jerry Dias, CLC President, Hassan Yussuff – embracing Ontario Labour Minister Kevin Flynn. The disastrous results of this growing hegemony of Liberalism in the major bodies of the labour movement, is that there is no effective opposition to the anti-worker policies of the Trudeau and Wynne governments. Trudeau’s government embraces capitalist trade deals (CETA, TPP, NAFTA), he endorses climate-killing pipelines, he introduces bill C-27 to undermine defined benefit pensions – and the CLC is mute. Meanwhile Kathleen Wynne’s government legislates teachers back to work, privatizes Hydro and installs the leading privatization advocate, Ed Clark, as head of the LCBO – and the OFL provides no meaningful opposition leadership or mobilization. All because Unifor is determined to get Wynne and Trudeau re-elected. However, there is growing opposition in the labour movement to this policy of being in bed with Liberal governments. The decision by Jerry Dias to ‘take his ball and go home’ and pull Unifor out of the CLC comes only 2 months after his embarrassing defeat at last fall’s OFL convention. Despite desperate maneuvering by Unifor operatives, the Convention adopted a policy to support the NDP in the 2018 Ontario election. Dias was furious, and threatened at the time that he would pull funding from the OFL. It seems clear that Dias wants to bully the CLC and Provincial Federations of Labour into supporting the Liberal Party – or else he will work to divide and undermine those bodies. If you look up ‘hypocrisy’ in the dictionary, you’ll find a gallery of pictures of Jerry Dias. 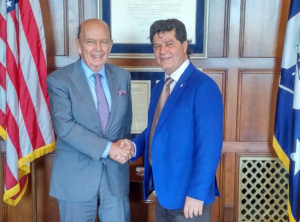 Was Jerry Dias defending democracy when he booted 5 BC Unifor locals out of the union without a hearing – a blatant violation of the Unifor constitution? Good morning NL and all ships at sea. Let’s see if I have this straight: Unifor Canada has broken away from the Canadian Labour Congress over a disagreement about the rights of workers to choose what union should represent them, even as FFAW/Unifor blocks inshore harvesters in NL from choosing their union fate. Gerrydiaz Lana Payne et al are full of sh-t.
Jerry Dias has allied himself with the Bay Street Liberal Party and turned himself into a shill for their policies. There is no better example of this than Jerry’s grandstanding as the supposed ‘voice of labour’ at the NAFTA negotiations. He is serving as the lap dog of Federal Trade Minister Chrystia Freeland (who continues to praise her Nazi-collaborator grandfather) and has made clear that he wants the Canadian and US governments to work together against the “real enemy” – Mexico. Instead of trying to build ties between US, Canadian and Mexican workers – which would be real solidarity, Dias disparages unions in Mexico. He calls them “protection” unions and claims they are in bed with companies and government. Instead of trying to work with the unions that actually represent auto workers in Mexico, Dias has made ties with a few dissident organizations. But if being in bed with corporations and their political parties is wrong – Dias and the UAW are as guilty as any union in Mexico. Here’s the kicker – in the joint UAW and Unifor NAFTA position paper from last summer, the source for information about Mexico – is the U.S. State Department! Jerry with Trump’s Commerce Secretary, the billionaire Wilbur Ross. Ross is a renowned vulture capitalist. Unifor members and locals should demand the immediate reversal of Jerry Dias’ undemocratic decision to pull out of the CLC. This action hurts the labour movement of Canada, which means it hurts all Canadian workers including Unifor members. This is happening at exactly the moment when there were strong grass-roots efforts to fight bad-boss Tim Hortons franchisees. Instead of raiding and division, we need all unions to work together to unionize low-wage workers. The autocratic, egotistical actions by Jerry Dias are dangerous and destructive. It’s time Jerry – time for you to go. If Jerry does not do the honourable thing and resign, we need to do the honourable thing and impeach him. Unifor National Executive Board unanimously (unconstitutionally?) voted to leave the CLC . This has caused a rift in the House of Labour and has rightfully gotten the activists of Unifor riled up, many of whom once belonged to a Regional Labour Council or Provincial Federation of Labour before this decision was made. As members of the Unifor Solidarity Network, we feel it’s important that you make your opinion heard directly to the NEB. We would also like to post your letters here as well, because we feel that this issue merits a full discussion with our members. We call on all Unifor activists to stand against this undemocratic power move by our NEB, and to continue our important work at the grassroots while our leaders waste valuable time and energy at the top. My name is Mike Mutimer. I’m a member of Local 222 and as of yesterday, I was a delegate and Executive Member at Large for the Durham Region Labour Council. I write to express my displeasure with the National Executive Board’s unanimous decision to immediately disaffiliate from the Canadian Labour Congress. While I can understand the NEB’s frustration with the CLC and the lack of action in regards to the bullying tactics of US based unions, are we not engaging in our own bullying tactic by withholding our per captia as Canada’s largest private sector union? 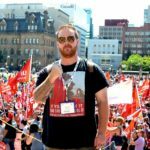 In your “Facts on Unifor’s disaffiliation from the CLC” article, you don’t clearly say that WE (as Unifor) are acting like bullies, however when you say things like “It is our hope that the action to disaffiliate from the CLC will trigger change to ensure that workers in Canada have their democratic rights respected”, one can clearly read between the lines. You’re hoping by starving the CLC of our per capita, they will “trigger change”. If that’s not a bully tactic, I’m not sure what is. This effectively removes two million dollars from their budget. Further more, it would appear NEB also acted in violation of our own Unifor Constitution which states in Article 19: Affiliations, Section 2 : Suspension or disaffiliation from the Canadian Labour Congress may be authorized by the National Executive Board subject to the approval of Convention, or the Canadian Council. Reading through the resolutions of 2017’s Canadian Council, I don’t see any type of approval given to the NEB to act in this manner. This should have been approved by Canadian Council last year prior to this decision and not to be dealt with later this year. I respectfully disagree that the NEB didn’t enter into this lightly. There has been conflicting messages in regards to affiliation to regional labour councils. If this was a well thought out decision, there would have been more discussion and especially with out members. This wouldn’t have been done during the middle of giant National Day of Action that has been put together by labour councils. The timing couldn’t be worse. To conclude, I’m deeply disappointed by this action. It seems to be exactly the same type of bullying tactic that has been used in the past when unions didn’t get their way in the OFL and now Unifor is doing it to the CLC. There are better ways to resolve this issue than to remove the largest private sector union in the country from the House of Labour. It appears the NEB acted in violation of the Unifor Constitution Article 19 Section 2 that says suspension or disaffiliation from the Canadian Labour Congress can be authorized by the the NEB SUBJECT TO APPROVAL of Convention or Canadian Council, which was not gained during the last 2017 Canadian Council. I really hope this decision is reversed as soon as possible. I’m writing to express my extreme displeasure with your recent unanimous decision to end our affiliation with the Canadian Labour Congress. The impact of this decision will have untold consequences for labour councils across the country and has absolutely embarrassed us in front of the broader labour community. If we are truly concerned about democracy, why was this decision carried out behind close doors on an executive level without any mandate from our membership? Why would our National President release a statement urging our continued participation in regional labour councils when Section 7 of the CLC constitution very expressly prohibits our continued participation? I am very aware of the situation with Unite Here Local 75 and the gross abuse of power and process they face at the hand of the UH International. I fully respect and support their right to self-determination as I have and will always place local union autonomy above all other union authority, however if it is self-determination we are truly seeking for these workers, would it not have sufficed to provide assistance for their highly capable, experienced, and engaged membership in the pursuit of their own independent direction instead of raiding their members and making Unifor the mockery of the Canadian labour movement? We are in a watershed moment as labour fights to defend the gains made under Bill 148, and we desperately need to organize service sector workers. Instead though, we will wind up wasting enormous sums of our dues both engaging in and defending against raids without protection under Article 4 of the CLC. Hundreds of our most dedicated labour activists have now been plucked from both leadership and rank & file roles within the regional councils, effectively tearing apart both their funding and capacity in some instances. These councils are the lifeblood of the labour movement and your decisions have done immense harm to not only the councils but to the public image of unions in general which are routinely painted as greedy and only interested in securing dues. Consequently, it will take years to mend the mistrust that has now been sewn between Unifor and the rest of the unified labour movement. This power move has come at such a grossly inopportune time, and has been carried out in such a callous and unthinking way that I question both the vision and intention of the primary motivators of this decision. With all of this said, I hope for the speedy and tactful rectification of this completely avoidable situation, and have faith in the ability of those on the NEB who recognize the true depth of this transgression against a united Canadian labour movement.